Imagine this: you are an up and coming 24-year-old hammer thrower ranked in the world’s top 10. You arrived at the Olympics in the best shape of your life, having qualified in fourth position and been on the podium in every meet except one that year. As you leave the call room in the depths of the stadium and emerge onto the track you’re greeted by more than 110,000 fans and also by torrential downpour. The throwing rings has quickly turned into a slippery lake. Now the competition is set to begin. How do you respond? We know how most people would respond, but this isn’t the story of most people. This is the story of Szymon Ziolkowski who was leading the competition 15 minutes later. He will be joining the HMMR Podcast next week to walk us through the competition. In the meantime, here are four key points that helped him turn a bad event into the highlight of his career. » Related content: Ziolkowski will be back on the podcast next week, but you can already listen to the last interview we did with him on Episode 122. We’ve all seen that at competitions: one person slips and the whole field tenses up. Ziolkowski had the advantage that he was the one who actually slipped and knew what he needed to do to fit it. This gave him an edge that helped him win. Of the 12 finalists in the competition, only three athletes had personal bests under 80 meters. Vizzoni and Tikhon were among them. Vizzoni was the only thrower in the field to hit a personal best and that helped him capture silver. Like Ziolkowski, Tikhon was just under his personal best. He tied for third place but lost out on the bronze as his second best mark was less than Igor Astapkovich. The underdog mentality is more than a label, it is a mindset. Later in Ziolkowski career he became a favorite, but he kept thinking of himself as an underdog. 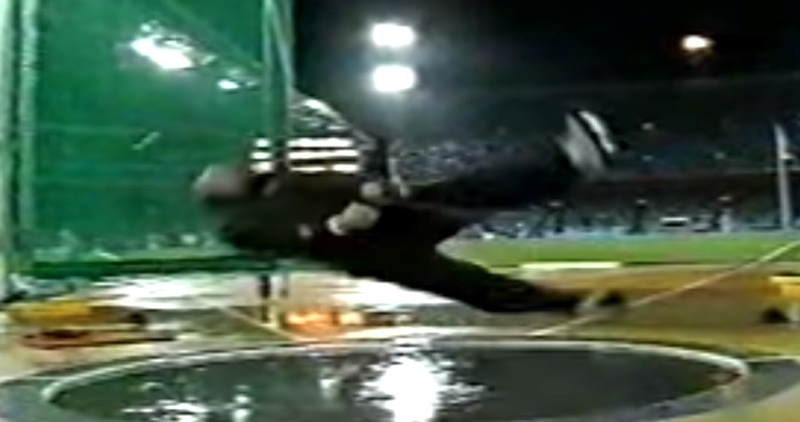 In 2001 you might think the defending Olympic champion would be a favorite at the World Championships, but some thought it was a fluke and the young Koji Murofushi was up and coming. Ziolkowksi tossed a meet record for a convincing win in one of the deepest competitions of all time. When I had the chance to compete against him he was nearing the end of his career. It would have been easy to think of him as past his prime and out of medal contention, but he continued to overperform for this very reason, winning global medals up to the age of 36. Even if you are not the underdog, treat yourself as one if you want to get an edge.